When I graduated from ASU, I wanted to move to "the big city" and see what I could do there. My degree is in Graphic Design, and I had a vague notion that I wanted to work for an Advertising Agency. I knew nothing about Los Angeles, but I did know that the Advertising Agencies are on Wilshire Boulevard (the equivalent of Madison Avenue in New York). So I headed out to LA in August (I didn't bother to wait for the graduation ceremonies, which are in December). What I found out was how insanely expensive apartments were in Los Angeles. Of course, I'd done no research, I hadn't talked to anyone, I just drove out there. I had no job, no prospects, but I figured that things would just work out. I was young! I settled into an apartment complex on Argyle north of Hollywood Boulevard. It was a bizarre combination of old Hollywood glamor, and run-down places that were cheap enough for people like me to actually live in. Hollywood in 1932. The Castle Argyle in the center of the photo, just south of the Argyle Apartments, which are on the other side of the street. 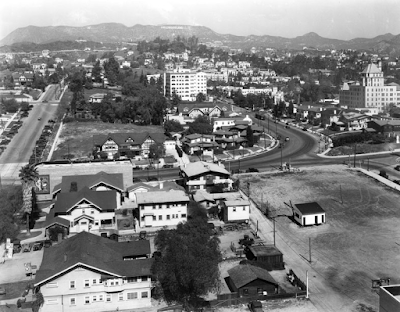 The Hollywood Tower is at right. When I lived there, the sign didn't say Hollywoodland anymore, it just said Hollywood. The Argyle Apartments had originally been built by movie director Cecil B. DeMille. Well, the nice part of the complex was! The part I lived in had been added on much later, and other than being connected to the rest of the complex, it had nothing in common with the original part. If you know the area, it's just a few doors down from the DeMille Manor, on Argyle just north of Franklin. 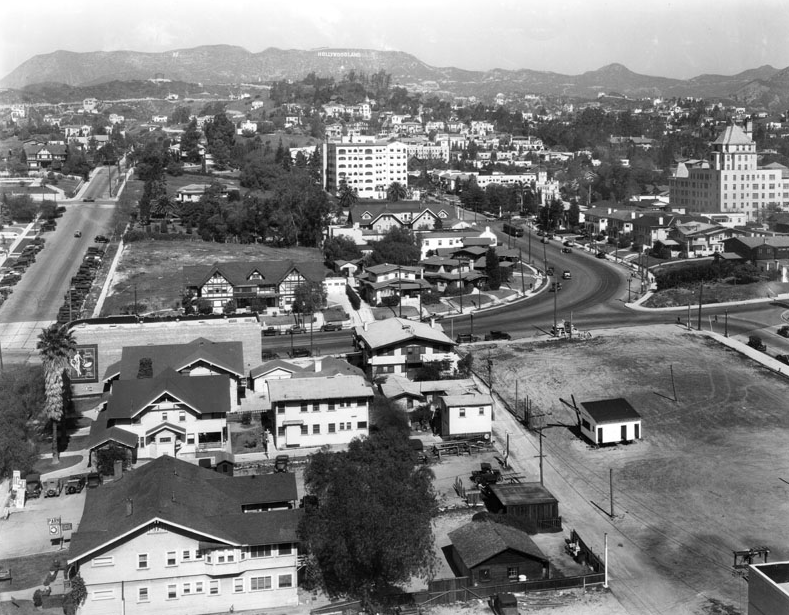 You know, north of the Hollywood Tower, north of the Hollywood Freeway, east of Vine. I spent the next four months looking for a job. I spent a lot of time sitting out in the courtyard, waiting for something to happen, and of course I met my neighbors. Not surprisingly, a lot of the people there worked in show biz, and that's when I learned that working for the movie studios, or TV studios, wasn't steady work. These people would do a job, get paid, and then hope for the next one. The people who managed their money did well, the ones who blew it all and then lived in poverty until their next job came in, didn't. In December I did get a job, which was a few miles north, in Santa Barbara. It wasn't what I had expected, but I needed a job, and my plan was to move at the end of the month, which meant that I would spend Christmas there, and try to be cheerful and optimistic about the future. 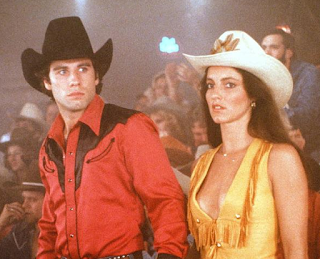 Madolyn Smith in Urban Cowboy. Everyone remembers John Travolta, and Debra Winger, but no one seems to remember Madolyn. I remember you, Madolyn! Thanks for the autograph! I was invited to a Hollywood Christmas party there at the apartment complex, and shyly attended. The other side of the complex had been built in the 1920s, and was gorgeous. The apartments were big, and for some reason I remember the beautiful tile. 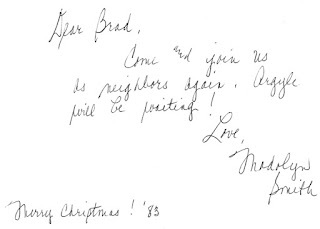 Everybody who was anybody was there, including me, the nobody from the crummy side of the apartments. Our big celebrity there was Madolyn Smith, who was "the other girl" in Urban Cowboy. She did a lot of work after that, but mostly TV, so if you've never heard of her, even if you've seen Urban Cowboy, I'm not surprised. I got her autograph that night, but I've never been able to impress anyone with it. I posted a picture of her on this post, along with some guy in a cowboy hat, whom I never met. His career did well! Hollywood people are so nice. 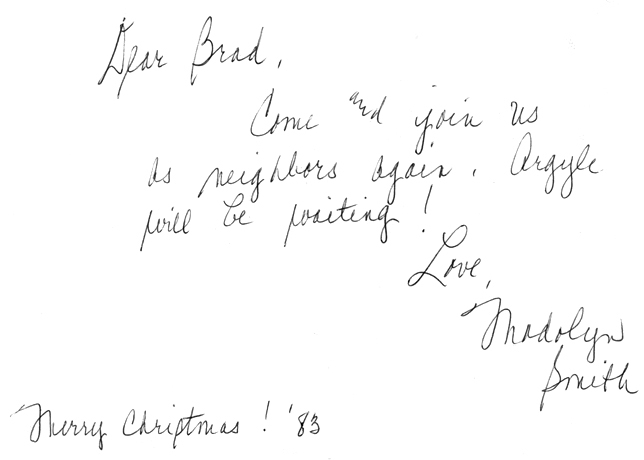 It's one of the best Christmases that I remember. But they did something that I didn't understand, hugging. And when I got ready to leave the party, I made an unpardonable mistake, I hesitated to hug Madolyn. She was wishing me well in my future success, and she wanted to hug me. She had a broken leg, and it was in a cast at the time, so it was difficult for her to walk, and she stood up for me. I shot a nervous glance over to her boyfriend, to be sure that it was OK, and in that instant I heard her say, "He doesn't want to hug me!" The room got quiet, and so I did my first Hollywood hug. Yeah, everybody in California hugs.